Used in conjunction with the TMS range of fixtures, the TMS standard fixture table is used for easy configuration and alignment of the test hardware. 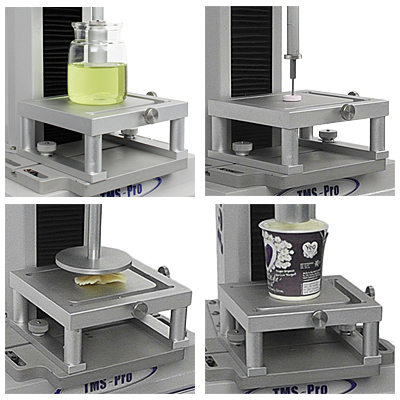 Samples can be tested directly on the flat surface of the base plate provided, or products can be tested in their containers. The reverse of the base plate supplied is designed with a 63mm recess. This enables, for example, rapid alignment of Bloom samples used within gel strength assessment. 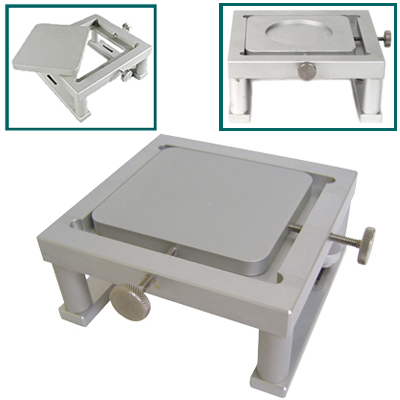 This fixture is much more than a simple testing platform, it is designed so that the base plate supplied can be removed and replaced by other standard Food Technology Corporation test fixtures. Each compatible accessory is securely held in place with the two thumbscrews provided. Its extra height allows test probes to completely pass through samples. Used in conjunction with the 'T' slot base plate, the fixture table is fully adjustable allowing fine precision alignment under a TMS texture analyzer's travelling beam. Dual movement both horizontally and vertically, means quick, accurate set-up of tests. In addition, the table is designed to accept competitor fixtures and accessories with dimensions up to 108 mm x 100 mm. This maintains consistent test conditions and facilitating cross-correlations between different instruments - for complete confidence when transferring texture methods between testing locations. Excellent customer service. Consistently followed up and offered help without asking. Relatively low priced - provides good value. Easy to switch different load cells. Used it for 5 lab sessions for 68 students this semester and performed well. I have been working with FTC for the past 3 years, we bought in that lapse of time 2 texture analyzers with different probes fixtures for all kind of applications at our Monterrey Plant. We have always been able to count on the technical support of FTC who kindly answers our requests in a prompt manner and with the best disposition. As we continue developing our process to achieve better results at our company, we will for sure rely on FTC for technical support and equipment upgrades that will deliver us the best possible results.